Truman’s Kohlenberg Lyceum Series will end its season April 2 with a one-of-a-kind performance by actors Danny Glover and Felix Justice. In “An Evening with Langston & Martin,” the two adopt the personas of civil rights leader Martin Luther King Jr. and Harlem Renaissance poet Langston Hughes. Playing King, Justice will bring to life two of the activist’s most memorable and inspiring speeches. Glover will read from the works of Hughes, demonstrating the poet’s uniquely African American words and rhythms. Glover weaves throughout his readings personal reflections on the impact of Hughes’ writings. A question and answer session will follow the two performances. Glover is an Emmy-winning film and television star and human rights activist. Inducted into the Black Filmmakers Hall of Fame in 1991, he has appeared in such films as “The Color Purple,” “Places in the Heart” and the “Lethal Weapon” series. Justice has been acting and directing for more than 30 years. His one-man Martin Luther King Jr. show “Prophecy in America” premiered at the Lorraine Hansberry Theatre in San Francisco in 1981, and has toured widely in the United States and Africa. Tickets for “An Evening with Langston and Justice” are available to students, faculty and staff with a University ID. Students may pick up tickets at the Student Activities Board Office. Faculty and staff tickets are available in the Center for Student Involvement. The Truman State University Bookstore is a platinum level sponsor of the Series and a special guest at this performance. For more information, contact the Public Relations Office at 785.4016 or visit http://lyceum.truman.edu. The Division of Business and Accountancy will present Susan Plassmeyer as the Executive-in-Residence April 4. Plassmeyer will lecture on “Fairness and Honor: Principles of Ethical Leadership in Business and Life” at 3:30 p.m., in Violette Hall 1000. “Practice Makes Perfect: Become the Business Leader You Would Most Wish to Follow” is the topic for her presentation at 7 p.m., in the Student Union Building Activities Room. Both talks are open to all students. Plassmeyer is the executive vice president of construction, engineering and facilities maintenance for Chicago Transit Authority. She is responsible for all construction and facilities activities, including management of a five-year construction budget of $1.5 billion, facilities maintenance, engineering and real estate work. Plassmeyer oversees a staff of 1,322. This semester’s Executive-in-Residence received her bachelor’s degree from Truman in 1986 and a master’s degree from the University of Chicago. Plassmeyer was the first student representative appointed to the Board of Governors. She currently serves on both the Truman Foundation Board and the Division of Business and Accountancy Advisory Board. This program is sponsored by the I.M.C.E.R.A. Group which endows the Raymond F. Bentele/Mallinckrodt Executive-in-Residence program. The Index, Truman’s weekly student-produced newspaper, won the Apple award as the best non-daily newspaper at the College Media Advisers National College Media Convention March 19, in New York City. 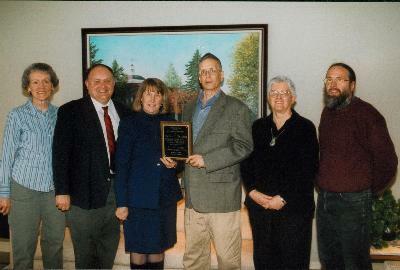 President Barbara Dixon (third from left) presents David Gruber (fourth from left) with the Missouri Conference’s plaque, which commemorates the naming of this award in his honor. Judi Misale (left), David Robinson (second from left), Martha Bartter (second from right) and Marc Becker (right), also attend the presentation. University professors from across the state recognized the initiative of David Gruber, professor of philosophy, earlier this month. The Missouri Conference of the Association of University Professors (AAUP) established the David F. Gruber Leadership Development Award at its statewide meeting, March 5, in Columbia, Mo. Gruber has served as an officer of the AAUP since 1993 and a member of the National Council of AAUP since 1996. The award in his name will provide monetary support to AAUP members who attend training seminars and regional or national meetings of AAUP. Four music students recently received $1,000 awards from the Macro Analysis Creative Research Organization (MACRO). The following students were awarded the Bruce Benward MACRO Theory/Composition Student Honorarium: Michael Van Bebber, graduate student with a concentration in composition; Carol Perry, junior music major from Cumberland, Wis.; and Brent Moran, sophomore music major from Fulton, Mo. Moran and Perry share an emphasis in composition. Brian Sevits, sophomore music major from New Whitehall, Ind., received the Robert Fountain MACRO Memorial Honorarium. Sevits has a vocal emphasis. The Benward Honorarium is a national award given to outstanding students in music theory and music composition. It is endowed by Bruce Benward, one of the nation’s leading music theory educators and scholars. The Robert Fountain MACRO Memorial Honorarium is a national award given to outstanding students in music performance who have demonstrated a sincere interest and aptitude for music theory. It is endowed in memory of Robert Fountain, an internationally-renowned university choral director and educator. The Macro Analysis Creative Research Organization is a national organization dedicated to fostering an understanding of the interconnectedness of various components of the music field: theory, composition, conducting, performance and education. With the conclusion of the American Forensic Association District 5 Qualifying Tournament, five Truman students have earned a total of seven bids to compete at the American Forensic Association’s National Individual Events Tournament (AFA-NIET) at Kansas State University, Manhattan, Kan., April 1-4. Elizabeth Hobbs, junior from Newton, Kan., qualified with bids in communication analysis and persuasive speaking. Meghana Kunkala, junior from Hattiesburg, Miss., qualified with bids in communication analysis and extemporaneous speaking. Matthew “Cody” Snyder, freshman from Neosho, Mo., qualified with a bid in impromptu speaking. Heather Timmerman, freshman from Hillsboro, Mo., qualified with a bid in poetry interpretation. Todd Turner, freshman from St. Louis, qualified with a bid in program oral interpretation. The Truman State University Financial Aid Office has announced the availability of several scholarships. The Beta Zeta chapter of Delta Kappa Gamma International is offering a recruitment grant of $120 to female students who meet the requirements. Applicants must be high school graduates from the Missouri counties of Atchinson, Holt or Nodaway. They must have a declared major of education, a minimum GPA of 2.5 and apply in the spring before they student teach. The application deadline for this grant is April 1. Students interested in pursuing graduate accounting study can receive financial aid through the AICPA John L. Carey Scholarships Program. Scholarships are available to all liberal arts degree holders of any regionally accredited U.S. institution who want to pursue a CPA certificate. Scholarships are awarded based on academic achievement, leadership and career interests. The awards are contingent upon acceptance in a graduate accounting program. Up to seven students annually will be awarded a $5,000 scholarship. Visit http://www.aicpa.org/members/div/career/edu/jlcs.htm for more information or to apply for the scholarship. Forms are due April 11. The Missouri Waste Control Coalition (MWCC) is offering its environmental scholarship to students who are interested in the environmental studies field. MWCC will be awarding one $500 scholarship to be used toward tuition, books and other educational expenses. Applicants must have a minimum GPA of 2.7 and attend or plan on attending a university or college full-time. The deadline for this application is April 15. Students can stop by the Financial Aid Office, McClain Hall 103 for more information about any of these opportunities. You are cordially invited to attend the groundbreaking ceremony for the new Residence Hall. *Please join us between 11-11:30 a.m. for refreshments and an opportunity to look at sketches of the new residence hall. Enjoy a night of Latin music and entertainment, and learn the moves from professional salsa dancers. Practice newly learned steps following the performance. Contact Lindsay Sims at 785.4167 or llsims@truman.edu for more information. Discuss the situation of women around the world with professors Sylvia Macauley, Marc Becker, Betsy Delmonico and others. Help honor extraordinary women in the Truman and Kirksville communities. Enjoy free dessert and beverages after the ceremony. For more information, contact Stephanie Le at 665.3373 or sdl000@truman.edu. Summer registration began on March 21. Sign on to TruView and access the “open course list” for additional information on both online and on-campus summer courses. Applications are due 5 p.m., April 1, in the CSI. Applications are due 5 p.m., April 7, in the CSI. Stop by McClain 303 for more information. John Ishiyama, professor of political science, and Marijke Breuning, associate professor of political science, co-wrote “A Survey of International Studies Programs in Liberal Arts Colleges and Universities in the Midwest: Characteristics and Correlates” for publication in the 2004 issue of the journal of International Studies Perspectives. Alumna Theresa Sonderman earned a 2005 Truman State University Distinguished Master’s Thesis Award for her thesis The Influence of First Language Phonology on Second Language Spelling. Sonderman’s thesis has also been selected as Truman’s nomination for the annual MAGS Distinguished Master’s Thesis Award. Janet Gooch, associate professor and director of communication disorders, was her adviser. John Applegate, professor emeritus of communication disorders, and Eric Jewell, associate professor of Spanish, also served on her thesis committee. Alumnus Eric Tumminia also received a 2005 Distinguished Master’s Thesis Award from Truman for his thesis River, Hills and Punk Rock. Mark Spitzer, assistant professor of English, advised Tumminia. Monica Barron, professor of English, and Becky Becker, associate professor of theatre, also served on his thesis committee. The BIG Event is still looking for volunteers to participate during the day of service. Contact the SERVE Center at 785.7222 for more information. Truman cheerleader tryouts will begin with an information night for all interested men and women at 7 p.m., March 29, in PB 231. Pershing will be open March 30 and April 5 for practice, and tryouts will run from the April 8-10. Contact Alisha Bollinger at 785.4577 or by e-mail at abolling@truman.edu for a complete listing of times and places. “Academic Integrity: ADA & FERPA for Teachers” is the topic for the Center for Teaching and Learning’s Weekly Lunch Series from 12:30-1:30 p.m., March 30, in the SUB Spanish Room. Call 785.4391 for more information. Kerry Magruder from the history of science collections University of Oklahoma will be speaking about Galileo at 3:35-5 p.m., April 1, in BT 251/252. For more information about this Physics Colloquium, go to http://physics.truman.edu/colloquia.html. The Truman football team will sponsor a Community Clean Up Day from 8 a.m.-noon, April 2. Players will provide free help with home repairs, yard work, maintenance and clean up at the homes of Kirksville residents. Residents supply the tools, and the team will supply the manpower. Contact Head Coach Shannon Currier at 785.4252 for more information. Midwest Junto for the History of Science, a regional group that meets annually, will meet at Truman from 8:30 a.m.-5 p.m., April 2, in the SUB Governors Room and also from 9-11:30 a.m., April 3, in MG 2050. Contact Peter Ramberg at 785.4620 for more information. Psychology students will display research at the Psi Chi 10th Annual Research Conference from noon-5 p.m., April 2, in VH 1000 and the VH Commons. The conference will feature presentations by Truman alumni who are currently in graduate schools, as well as a graduate question and answer forum. Contact Erin Haslag at d2031@truman.edu or at 665.7895 for more information. A Parade of Flags, sponsored by the International Club, will wind through campus April 4. The parade will begin at 3:30 p.m., at the Kirk Building and end at 4:30 p.m. at the SUB. Refreshments will be served after the presentation of flags and speeches at the International Student Office. Maria Di Stefano and Maureen Bell will present their research “Promoting Student Success: Development and Assessment of an Early Identification Model,” at 4:30 p.m., April 4, in the SUB Spanish Room. Di Stefano, Bell, and Suzanne Pieper received an Assessment Grant in 2004 to research this subject. The Second Annual Truman Football Alumni and Friends Golf Tournament will be from 8 a.m. to 1 p.m., April 29, at the Kirksville Country Club. A Social/Silent Auction will precede the tournament at 7 p.m. April 28, at the Day’s Inn. All proceeds benefit the Truman State University Football Program. For more information and registration forms, visit http://gobulldogs.truman.edu/sports/men/football.aspx. Payments and forms are due April 4. PRISM is sponsoring singer-song writer Sacha Sacket live in concert from 7-10 p.m., April 5, in the SUB Down Under. Sacket’s performance is free to students, faculty and staff. Visit http://www.sachasacket.com to hear samples of her music. Contact Greg Wisa at mailto:gaw001@truman.edu or by phone at 785.7189 for more details. Habitat for Humanity is sponsoring Act! Speak! Build! Week April 5-7 on the Quadrangle. The week is part of a worldwide, student-initiated day to advocate affordable housing. Dan and Gaylene Green will be visiting Kirksville April 10. The Greens will be assisting churches of Christ in campus ministry at Truman, A.T. Still University and the Moberly Area Community College. They will be residing at Ekklesia’s newly acquired house near Truman’s campus. Dan Green will preach at the Kirksville Church of Christ at 11 a.m. For transportation or more information, call 627.4003. University Counseling Services, Bacchus and Gamma, and MO PIP are sponsoring National Alcohol Screening Day. From 10 a.m.-3 p.m., April 12, on the Mall, individuals can be screened to see if alcohol plays a negative role in their lives. Students can receive resource information about alcohol and substance abuse and participate in mock-drinking activities. Individuals who complete a survey will have a chance to win various raffle prizes. Free non-alcoholic drinks will be available too. Contact Phil Jorn at 785.4014 or pjorn@truman.edu for more information. The Society of Dance Arts is sponsoring Dance Fusion 2005: “Shall We Dance?” April 21 and April 22. Free to the public, the event will take place at 7 p.m., in Baldwin Auditorium. Guests include High Street Dancers, the University Swingers, Showgirls, Ceilidh Dancers and Praise Dancers.